If your kids need some new glasses in time for back to school, you’re in luck. You can always get a complete pair of eyeglasses with prices starting at $39 from 39DollarGlasses.com. 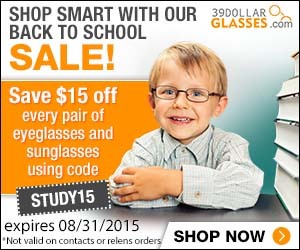 For a limited time, you can save $15 off any pair of glasses from KidsGlasses.com and 39DollarGlasses.com by using the coupon code STUDY15. This offer expires August 31, 2015. The site has a wide variety of frame choices for boys, girls, men and women, both eyeglasses and sunglasses. Plus, you can get a free complete set of glasses when you buy an annual supply of contact lenses. You can use the site’s Exact Fit Try-On tool to make sure your kids’ glasses will fit perfectly. Orders over $99 ship free via USPS First Class mail. Other orders cost $4.95 for standard shipping. At 39DollarGlasses.com, you also get a 100% Worry Free Guarantee on most purchases, with free return shipping and a free one-time exchange if you’re not happy with the purchase. You’ll save a boatload of money buying glasses online rather than at your local eye doctor’s office. At these prices, you can afford to have at least one spare pair, too. Read more of my articles about saving money on glasses and contacts at this link. Buy 50 Prints, Get 50 Free at Walgreens.com, 20% Off Everything Else!